Today, Internet is the ultimate healthcare adviser. From the smallest of ailments to the biggest medical complications, we prefer to pick Google’s brain even after we have had a long discussion with our experienced family doctor of over 20 years. Patients and their family members are always keen on researching and then researching some more about what internet has to say about the problem at hand. And when that happens, you want the internet to speak highly about you, no matter who is asking. For that to happen, you need to do your homework. Is your website just beautifully designed or actually follows a sound marketing strategy? Your website is not just a flashy banner to greet the online visitors at your virtual door. It is supposed to perform a very significant function in the digital space. Converting your website from a pretty wallflower to a fully functional digital asset requires a crucial ingredient - updated business strategy. The online space is a highly lucrative platform if you can explore it in the right manner, or have someone to show you the ropes. An inadequate website design can be disastrous to your business. It can cause an untimely shutdown of important departments or even the whole unit even before you get a chance to share your brilliant vision with the rest of the world. Haven’t thought about it this way, you say? Read on to know more about and solve the mystery of dwindling ROI once and for all. Since you are still on this page, you either own your own clinic/hospital or you manage the marketing department of a healthcare business. By now, you must know the symptoms of a failing business better than anyone else. There have not been any noticeable growth in the number of new patients admitted to the hospital for a while. Monthly profit margins have not been matching up to the initial boost that your business once enjoyed. Number of daily calls and appointments have been either stagnant or lower than ever. Even your loyal customers are secretly switching to your competitors who have perfected their online game to the last detail. Your treasured specialists are already looking for greener pastures since they know a sinking ship when they see one. But, things don’t have to be like this. Lets start with diagnosing the problem ailing your hospital business first. One can say that website design is the first thing that users notice while visiting a new website. But what good is a website design if it lacks a powerful strategy to help both online visitors with their search and hospital with attaining consistent business growth. Almost every other hospital website falls into this totally unnecessary good website debate which serves zero purpose. Rather, the debate should be about business objectives and how to achieve them in a timely manner with strategic design and functionality. A website design can be termed good only when it unfailingly reaches the day-to-day goals set by the hospital business plan. It is not meant to be the aesthetically appealing centerpiece of your online space that random people admire for its soothing color coordination. Hence, one can say that STRATEGY should be the Central Nervous System of a website. It is the brains behind the reliable and inviting face of your online persona that guides the visitors seamless throughout your website. It creates the awareness among users, interests them in an online conversation, nudges them to consider and finally converts them into a confirmed positive prospect, who may now have enough confidence in your services to get a treatment from you right away or in the near future. If you have a non-functional or faulty website strategy, your online visitors have no one to guide them through your website as you want them to perceive it. Your business is left at the mercy of occasional visitor who decides to stay on your web page for a while and then move on to a more alive and conscious digital arena of your competitors. The core of all successful hospital marketing websites is a robust website strategy. And that is where your business has been lacking all this while. You listened to all those so-called online marketing gurus who wooed you with their knowledge of current marketing trends but lacked in-depth knowledge of the whole online marketing realm. A website with HD welcoming images and zero online viability still represents a poor website strategy to attract the right kind of audience to your hospital. There is a lot of planning that goes into the creation of a sound website layout. Just like it is done in hospitals, you need a consultation with a specialist for getting your website’s health back to its fighting fit self. Avoid the ones that are high on jargon and low on actual contribution. You must know how to spot them by now. Go for the website design partner that talks to you like an experienced doctor does to his patients. They are sensitive to your issue, consider the gravity of the situation and explain to you what exactly is wrong with your body at a pace that is easy to comprehend and process. They know that it is a tough time for you and guide you patiently through the entire process. They hold your hand when they see you giving up and motivate you to keep on fighting because they believe in you even if you don’t believe in yourself at that very moment. When you are online, you have the global platform at your disposal and so does every other competitor of yours. What you do with the available platform will set you apart from rest of your competition. According to a recent survey published by India Digital Health Report 2017, 84% companies in the healthcare sector are inactive. 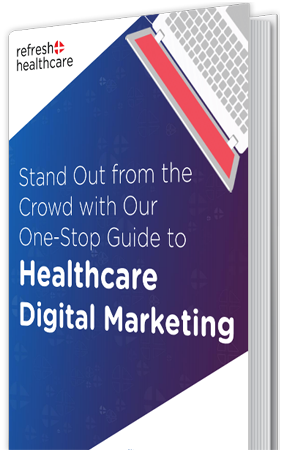 Here is the chance to ace your hospital marketing game with help of right strategy so that you can challenge even the giants in your specific field of expertise. People today don’t mind traveling halfway across the globe to get treatments from healthcare brands they trust. This can be a humongous opportunity for your hospital to shine better than the others since your website is the first point of contact between you and the patient. This first impression may make or break your business relationship. And, with the skilled experienced minds at your disposal, you will increase your probability of growing the hospital revenues. Not only that but sometimes people travel afar, not knowing about your relevant healthcare facility or having enough exposure to it for trusting its competence. They might just be two streets away and need exactly what you specialize in. But they don’t know that you exist yet. You need to pick the right strategy and medium to tell all potential clients like these that your healthcare facility is at par with the overpriced healthcare service they are ready to spend so much time, money and efforts on. The digital age is here to stay. Embrace it. Engage with it on a daily basis. 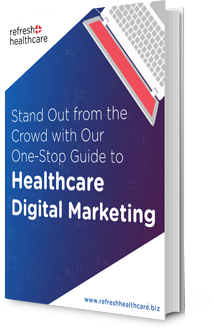 Get in touch with healthcare digital marketing agencies who are passionate about their business just as much as you are about yours. Get regular updates on the health of your business and all the primary factors affecting it. Don’t make it a once-in-a-while chore. The best part about effective digital services is that you can predict everything about it. You can control it as per your requirements and use it in your favor seamlessly with the right assistance. Just like your health, it is important to take daily care of your business. The digital platform is constantly evolving. And whether people like it or not, their business does come under that digital radar. You can either choose to totally ignore this fact and let your website design, strategy and marketing practices suffer a slow degradation. Or you can take the next step to success. This blog does end here. But it can be the start of a whole new chapter for your hospital/clinic/healthcare business. A chapter that is not riddled with failures and downfall. But one that is the beginning of your glorious success story. We at Refresh Healthcare are no miracle workers. But we are the best at our job. From hospital website design to online marketing practices, we can help you with the right dose of strategy and execution. So before you close this tab, just give us a call and let’s keep this momentum going!